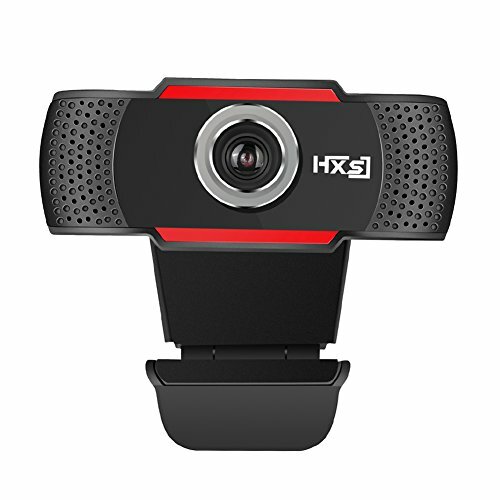 HXSJ brand HD 720P built-in 10 m sound-absorbing microphone, high-definition computer camera. can be clearly heard within 10 meters, which means you do not have to close, or even kiss your camera awkward. It can bend and stand as you like. 720P high-definition camera, True color images. Up and down 30 degrees can be rotated, you can adjust the angle as needed. Imported optical glass lens, high-precision, no distortion of the picture. Manual focus, you can freely rotate the lens to adjust. Designed for laptops and desktops. Support Windows 2000 / XP / win7 / win8 / win10 / Vista 32bit, Android TV. Support a variety of video conferencing software, Netmeeting and MSN, Yahoo and Skype and other great projects, enjoy the big-screen visual experience. 720P high-definition camera, True color images. Up and down 30 degrees can be rotated, you can adjust the angle as needed. Imported optical glass lens, high-precision, no distortion of the picture. Manual focus, you can freely rotate the lens to adjust. Designed for laptops and desktops. Compatible with USB2.0. Automatic white balance, automatic color correction. If you have any questions about this product by vanpower, contact us by completing and submitting the form below. If you are looking for a specif part number, please include it with your message.